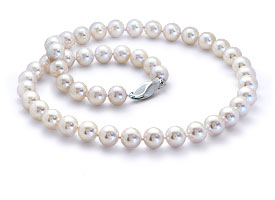 At Blue Nile we offer a variety of Akoya, Freshwater, South Sea, and Tahitian cultured pearls. Our pearl jewellery is available in a variety of different styles including studs, fashion earrings, strands, necklaces, pendants and bracelets. In addition, we offer our pearls in varying price ranges so that you can find the perfect pearl for your style and budget.